For to ride a baggage cart, Dol Li A. 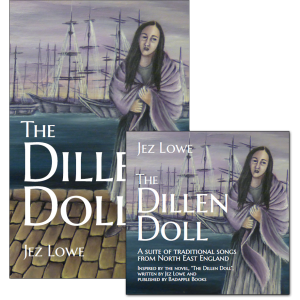 Award-winning songwriter Jez Lowe has stepped out of his long-held role as a singer and instrumentalist to complete his debut novel, a tale of romance, adventure and social change in early 19th Century Newcastle on Tyne, entitled “The Dillen Doll”. Leaning heavily on the balladry of traditional folk songs and the real-life characters of historical Tyneside, Jez imagines the background story of the eponymous heroine of a widely-known and plaintively simple Northumbrian ditty entitled “Dol Li A”. This mysterious, melodically-hypnotic folk song, with a dozen or so child-like lines and an enigmatic heroine, has survived in popularity for over three hundred years. It vibrates with the echoes of cobbled Newcastle streets, a busy quayside and a bustling River Tyne. But who was the woman who inspired the ballad? Long immortalised in street rhyme, Jez Lowe’s central character is a simple quayside scullery-girl called Dolly Coxon, who finds true love against a backdrop of peril and treachery, as all around her heated talk of imminent war and desperate immigration casts fear and dread through the crowded alleys and chares. With the help of a rag-tag of musicians, agitators, camp-followers, sailors, soldiers and men of the cloth – all committed to the cause of finding justice and freedom for the common working man – Dolly unravels the history of a Genoan folk hero in exile, and writes herself into a new chapter of English folklore. To accompany this, his first novel, Jez Lowe has recorded a suite of Tyneside folksongs, many of which are referenced within the story, and were the inspiration for the adventures within it. A forty-five minute, continuous piece, with fifteen newly-arranged ballads contained therein, this ambitious and unique album features Jez playing most of the music himself, with additional contributions from his regular band The Bad Pennies (Kate Bramley on violin, Andy May on Northumbrian pipes and David De La Haye on bass and the album’s producer), with vocal support from Benny Graham, Rachel Hamer and Kari MacLeod (who also created the evocative artwork on the cover of both book and CD). With twenty albums to his credit, Jez Lowe is one of the hardest-working performers on the acoustic/folk circuit, and his songs are among the most widely-sung, both in the UK and around the world. As a principal writer for the prestigious BBC Radio Ballads series, Jez continues to push the boundaries in his writing, and with this project has moved bravely into the field of fiction and developed his own musical expression, in one ambitious leap.